You might be interested to know why I started researching my family history. I brought my first ever computer on christmas eve 1997, at a time when computers were just beginning to go mainstream. Amongst the selection of accessories that came along with it were some CD’s to help you create a family tree, called Family Tree Maker. I did not look at these CD’s for some months. I was 38 years old now and had looked briefly at those CD’s, but that was all. I knew absolutely nothing at all about my family history so did not go any further with it. My dad phoned me from London one day. “Can you remember seeing a photograph of my grandparents when you was a child?” I replied No. “I will send you a copy through the post” he said. It was a hot sunny morning in the August of 1999, when the postman arrived at my front door before quickly delivering the post through my letter box. The letters that dropped on my doormat that day contained all the regular stuff that everybody gets – except for one that caught my eye. It was a letter postmarked London and had been sent by my father. I knew this letter was coming – I had been expecting it. Feeling a little Intrigued, I peeled back the envelope flap, and opened the letter taking good care not to damage the contents. Inside the envelope was a black and white photograph that looked to be about 100 years old. It was a portrait of a very smartly dressed couple. On the back of the photo was written their names – Edward Hugh Hodgson and Mabel Victoria Bent. My father had also written down their birth years of 1880 and 1883. His grandfather, Edward, was known as Mass Teddy – short for Master Teddy. His grandmother was called Grandma Mabel or Miss Mabel. I stared closely at the photograph and saw that ‘Grandma Mabel’ was black – no surprise there, that was to be expected. But I was totally bemused when I saw that ‘Mass Teddy’ looked to be white. What a surprise that was. I thought that all my ancestors would be black. It was really thought-provoking, it intrigued me and stayed on my mind. After thinking about that photograph for a while, I called my father to ask him questions. “I thought Mass Teddy might have been your father” “No, my father’s name was Aubrey – Aubrey Hodgson – he died when I was 7. I can’t remember what he looked like” he replied. “I didn’t know your grandfather was white, I thought all your family were black” I said. The moment he began speaking about them, my head started to spin just trying to absorb all the information and stories being quickly thrown at me. I reached out for a pen and sheet of paper lying next to me and tried to scribble down what I was hearing. From that very moment, I was hooked and instantly became interested in the lives of my ancestors and felt the need to know everything about them. My dad would often visit his grandparent’s at their Southfield home when he was a boy. In the 1950’s, just prior to him moving to England, dad lived with his grandfather for 18 months. Mass Teddy would talk to him a lot and tell him things about the family and my father recalled many of the things that his grandfather told him. When I was a child, I remember dad telling us all funny stories about a person called ‘Mass Teddy’ but never quite knew for sure who that person actually was. Well now I knew. I nervously called Hortense and introduced myself to her as Rennie Hodgson’s son – as instructed by my dad. She was very happy to hear from me, and keen to tell me what she knew about our history. It was a wonderful conversation. Mass Teddy’s mother was half black? Mabel’s grandmother ‘Cousin Jane’ used to be a slave? Mass Teddy’s father inherited off the Scottish Bromfield’s? Mass Teddy told her the Bromfield’s were very rich and powerful? The Hodgson’s came from Scotland? So that was it, that was how It all started. Who was Cousin Jane, who were the Bromfield’s? Could I investigate and solve all the stories told to me by Aunt Hortense and my dad? Could I prove or maybe even ‘disprove’ any of those handed down stories? Well I was certainly going to try. I then set off on a long journey, a breathless investigation that would continue for the next two decades. It turned out to be a magical journey of discovery which has helped me to fully understand and appreciate who my ancestors really were. The journey has taken me to various countries, towns, cities and many beautiful villages in my quest to research my family history. It took me To Jamaica And Beyond. Full of many highs and lows, it has been very thought-provoking and has helped to bring my ancestors back to life. The research into their amazing history has been conducted every day for a period of 18 years and will continue…. It’s wonderful to read about someone doing this. It’s a goal of mine one day to get a genealogy report and find out more about my ancestors. I’m sure mine will take me through Jamaica and beyond as well. Thanks Robert! I appreciate your kind words very much. I certainly will one day. Considering how much I love history too, I can imagine how exciting it’ll be to learn more about my own roots and family history, especially on my paternal side. Thanks for visiting my blog. Take care! Having spent my teenage life in Southfield prior to my return to Redditch in Worcestershire where I was born. I always knew Southfield was a great place with a lot history. 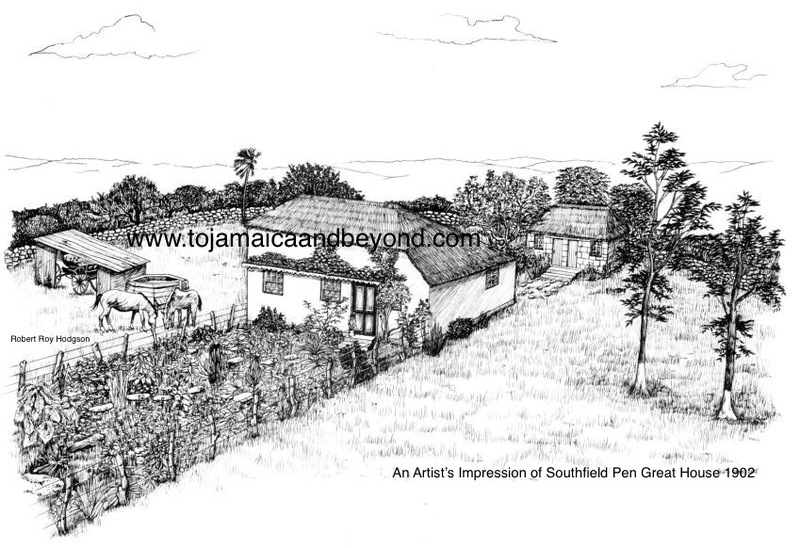 Upon my return in 2011, I began trying to ascertain if there were any books etc written about Southfield’s history. I was very disappointed to learn there was nothing whatsoever. I googled and saw an article by Mr Hodgson about Southfield Great House, which I did not know about and the rest is history. Mr Hodgson your stories etc are amazing and informative. ANSWER: My grandfather Edward Aubrey Hodgson was born at Southfield on the 5th January 1910. That was 109 years ago. ANSWER: My great grandfather Mass Teddy died at Southfield on the 21st January 1956 - That was 63 years ago. © 2019 Robert Roy Hodgson and tojamaicaandbeyond.com. Unauthorized use and/or duplication of this material without express and written permission from this site’s author and/or owner is strictly prohibited. Excerpts and links may be used, provided that full and clear credit is given to Robert Roy Hodgson and tojamaicaandbeyond.com with appropriate and specific direction to the original content.